FACT CHECK: Should Mosul Have Been A 'Sneak Attack,' As Donald Trump Said? In the last days of the presidential election, experts are questioning whether Donald Trump's public stances on defense strategy present him as a qualified commander in chief. 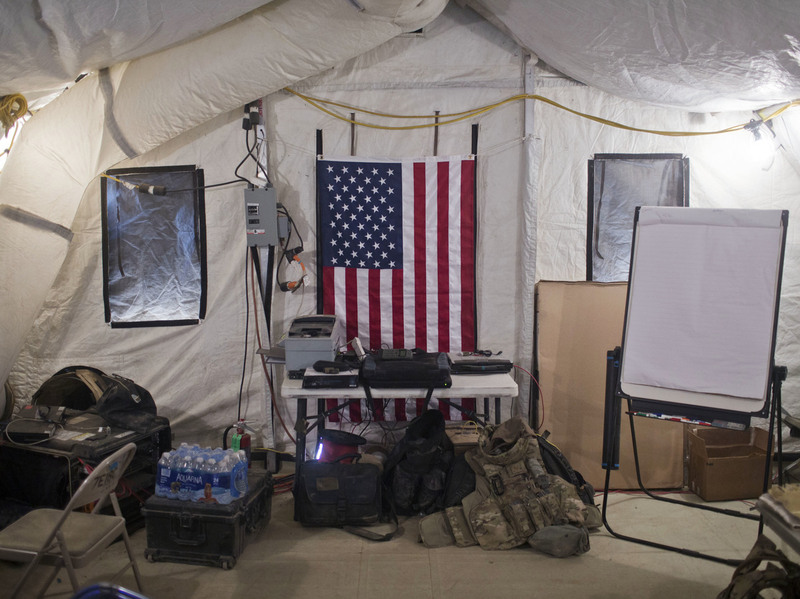 A U.S. flag hangs on the wall of a Qayara command-and-control center at a coalition air base about 30 miles south of Mosul, Iraq. "They announced four months ago, three months ago, 'We're going into Mosul. We're going to get the leaders of ISIS because they're living in Mosul,' " he said in the final debate. "Guess what? Twelve minutes later, the leaders, they left. They're not stupid. They left. Whatever happened — remember what the great generals called the element of surprise? The element of surprise." Is Trump correct that the U.S. talked about attacking Mosul three or four months ago and that the "element of surprise" would have been a better strategy? Experts say Trump is missing some basic elements of the situation. First, leaders of the Islamic State are based in its self-proclaimed capital of Raqqa, in neighboring Syria. Second, the U.S. has been talking about attacking Mosul for more than a year — before Trump was in the presidential race. Third, analysts say there are good reasons to talk openly about what the U.S. and its allies are planning. "Trump seems not to understand rudimentary elements about the use of force," said Kori Schake, a defense policy adviser for the George W. Bush administration and senior policy adviser for John McCain during his 2008 presidential run. "For example, the moral and operational value of separating civilians from combatants — that is the purpose of telegraphing the approach on Mosul. It's to allow civilians to flee the city, which is a humanitarian gesture underscoring the difference between coalition forces and ISIS." That's important both for humane reasons and to avoid supporting ISIS propaganda. But it's not just about being nice. Schake calls it "a practical measure to make identifying ISIS easier and reducing the prospect for them hiding among the population." As for that "element of surprise"? "Announcing the Mosul battle is important messaging to those civilians trapped in the city to flee if they can," said Randa Slim of the Middle East Institute. "[Trump's] monologue about the Mosul battle revealed ignorance with the dynamics on the ground, the multiplicity of actors, and the regional dynamics." Trump's critique seems more focused on criticizing the Obama administration and the Pentagon than analyzing the situation in Mosul. In some appearances, he goes as far as actually complimenting ISIS. "By the time we attack them, all the guys that we want are going to be gone," Trump said at a Charlotte, N.C., rally on Oct. 14. "They're very smart. How stupid are the people that run our country?" A previous version of this story incorrectly referred to a 2012 presidential run by John McCain. That campaign was actually in 2008.